San Colombano was established in the 1850's in Barrio Playa of Guayanilla by my 3rd Great-Grandfather Antoine Francesco (Antonio Francisco) Negroni-Mattei (1794-1861) who arrived in Puerto Rico from San Colombano, Corsica (hence the name) June 1, 1822. Antonio Francisco devoted his life to agriculture, founding two ingenios during his lifetime, his first ingenio, Hacienda Florida was established in 1840 and San Colombano in the 1850's. he also owned "La Fortuna", a coffee plantation in Maricao, which was inherited by his daughter Maria Luisa and from then on passed to the Lluch family by marriage. The cholera epidemic of 1856 killed most of his slaves and in 1862 Antonio Francisco, due to financial difficulties, sold San Colombano to the firm Tirado & Labarthe of Ponce. The plantation was later acquired and incorporated into the Central Rufina sugar mill. 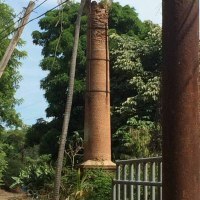 It is uncertain if the smoke stack pictured below is the only remain of this sugar factory, it is right on the edge of the town of Guayanilla in the general area where San Colombano was located. Some suggest though, the chimney was part of a block factory that existed there long time ago.